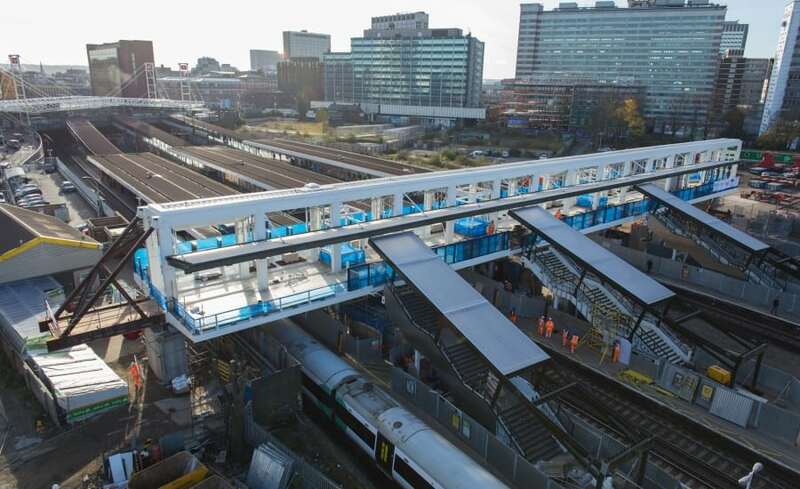 The busiest train station in London, East Croydon Station, is undergoing a dramatic extension. At the heart of the station is a new 105m long pedestrian bridge with 800m2 of ETFE foil covering the walkway and four platform staircases. With all of the choices available for roofing materials today from metal to glass, ETFE was chosen because it is lightweight, bright, easy to install and economical. ETFE is 1% the weight of glass, providing cost savings for both steelwork and foundations. 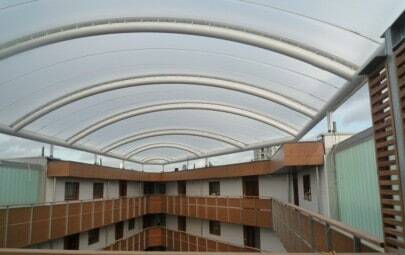 ETFE is being used more and more in the transportation sector because it is bomb blast tested and approved. 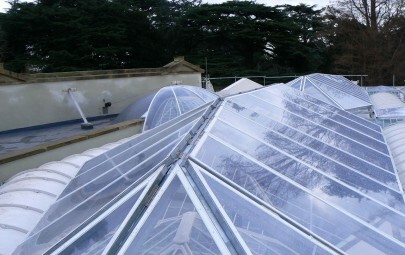 ETFE can be specified with many layers – anything above two is a classified as a cushion, requiring an Air Handling Unit to keep it inflated and under pressure. 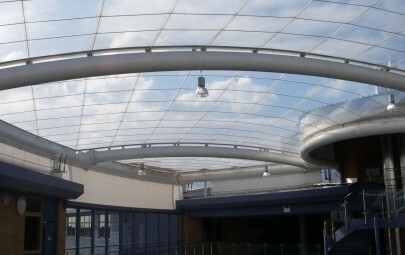 In the case of East Croydon, a simple single layer ETFE foil system was specified. Single layer systems are economical, quick to install and easy to maintain. The ETFE roof spanning the bridge has 13 independent foil panels with steel support cables. The cables prevent uplift and are engineered to for snow loads. Covering the four staircases are five foil panels per staircase. The open air ETFE walkway canopy provides all weather protection for travellers getting on and off trains in the station. Rainwater is managed through a series of gutters and hoppers installed throughout the vast ETFE roof. Hoppers channel water down the steel columns, underground and away from the site resulting in a clean, dry, open air station. To help control the amount of sunlight entering the space, Architen Landrell recommended Fritting, a process whereby the ETFE foils are printed with a pattern to help reduce the amount of light transmission. 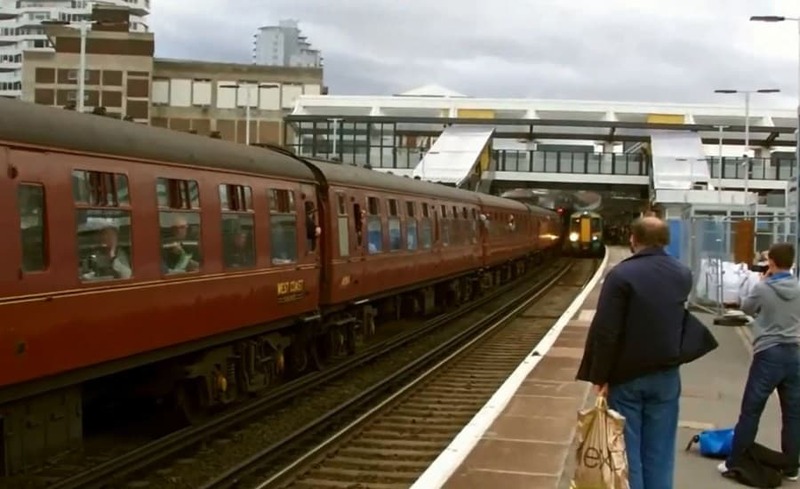 For East Croydon, we recommended a 16mm silver dot pattern this reduced light transmission from 85% to 74%. On a bright day, the space below will not heat up like a greenhouse – yet it will be light enough to not require an abundance of overhead lights during the day. The bridge was not built in situ. It was built and then rolled (literally) into place using specialist heavy duty plant. 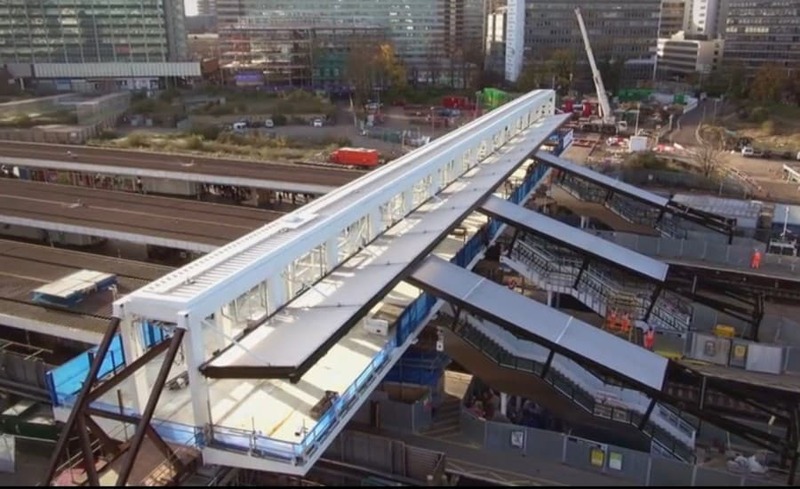 The following video from Bam Nuttall/Network Rail shows how the bridge was positioned into place – a remarkable achievement requiring careful logistics and planning. Architen Landrell is known for being flexible and able to accommodate our clients requests. Because trains were in motion on the tracks, we installed the ETFE system at night between 12 AM and 6AM this allowed for business as usual during the day and the project to progress at night. Simultaneously, Architen was also installing an ETFE foil cushion roof over the new Northampton Bus Interchange. Having worked with BAM Nuttall on: The London 2012 Olympic Bridge Project, Archbishop Grimshaw School and Liverpool Community College, it was good to partner on another project.